superfood concentrate -- thus the name UltraFood™. Numerous news articles have reported that the Fukushima meltdown is not yet contained and continues unabated across America. The long-term carcinogenic consequences of this radiation compels serious attention to your DNA and immune system. The most significant detrimental effect of ionizing radiation is weakening of the body's immune system. It's the same with cell phone radiation and ELF pollution. Swedish Pollen Extract has extensive research to show the regenerative effect for DNA, your immune system, and disease-fighting abilities. This is why medical doctors use it in drip-IV's for immunotherapy in advanced cancer treatments. As you may know, everyone gets some cancer cells in their body, but the immune system keeps them in check. When we consider that one of the side effects of radiation exposure is cancer mutations, the importance of strengthening all glands of the entire immune system becomes self evident. Cleansing superfoods such as chlorella, spirulina and seaweeds have been used as far back as World War II to help clear radiation exposure by flushing radioactive substances from the body. But for overall immune support and body detox, land-based life thrives best on the terrestrial food-chain's foundational source. Pollen Extract simply removes the indigestible pollen husks' obstacle to assimilation of the nucleic material. There is a frenzy of interest in potassium iodide for radiation exposure, but rarely does the market reference toxic side effects for the thyroid, heart and liver. As a general rule, natural alternatives are denied efficacy by the medical-industrial complex. There's simply little money in natural remedies compared to drugs which are chemically synthesized, patented and marketed for huge profits. Peer-reviewed medical research from doctors worldwide have validated the superior efficacy of Swedish Pollen Extract, not just for its antioxidant value and higher white blood count markers for the immune system, but also for protecting the whole body from radiation (not just the thyroid), and for body detox from its effects. My personal experience goes back decades, supplying major health companies in North America. In 1987, I went to Sweden and met with the owners of the company that pioneered the science of pollenology 50 years earlier, including the study of which pollens have the ideal micronutrient profile for humans and how to harvest those pollens. Since then, they have discovered how to remove the hard microscopic pollen husks without chemicals, and how to predigest those complex molecules with live enzymes so they are easily assimilated and non-allergenic. 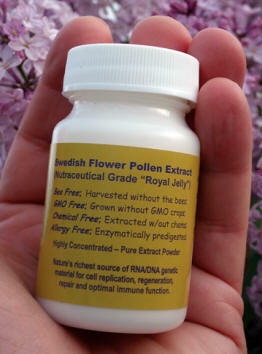 This extract is virtually standardized, nutraceutical-grade royal jelly. After giving the principals of this company a presentation for brokering their Pollen Extract to the four major direct-to-consumer markets in America, I was given the North American rights. I also developed several product lines for American companies – and for my own holistic health clinic -- seeing the results of this richest source of powerful micronutrients for glandular health and genetic repair known to the plant kingdom. Swedish Pollen extract takes this unequaled source of life-giving super-nutrients to a higher level of assimilable utilization by the body. (3) predigesting the raw extract with enzymes (for non-allergenic bioavailability). This pollen extract is extremely rare in the natural supplement industry today because people confuse it with bee pollen and buy on price rather than quality. Companies find it more expensive educating the public than selling the substandard bee pollen which is extremely allergenic with only about 3% of the nucleic pollen extract bioavailable since the microscopic pollen grain husks are virtually indigestible. It is the pollen extract – called “royal jelly” by bee-keepers – that bees extract from the pollen husks and store when they want to create a queen bee. When fed this quintessential superfood from birth, an ordinary bee becomes three-to-five times larger and lives much longer because of the pollen extract “royal jelly”. It’s one of the miracles of nature – how those queen bees also become extremely healthy and “fertile", laying tens of thousands of eggs to propagate the hive. If you could buy 100% “royal jelly”, it would be extremely expensive, and most companies use only approx. 5% royal jelly as required by law to say it is “pure”. What many people don't know is that Swedish Pollen Extract is 100% standardized pure (pharmaceutical grade) “royal jelly” without the bees. There are no quality controls with highly allergenic bee pollen which is graded by the level of infestation by fly eggs, fungi, rodent dung, etc. 1. Unequalled Antioxidant and Cellular Rejuvenation Benefits. I’ve seen the most significant over-all health benefits compared to any other whole food concentrate. Because of my close work with the Swedish company, I saw European and Japanese research which documented the kind of health benefits unreported in the U.S. But since there is a catch-22 in FDA law, any documented health benefit for a natural food makes it a “drug” requiring regulation out of consumer markets so that only medical doctors can prescribe them. That's why I make no claims, even though I know it is the prescribed remedy for colds, flu, and numerous serious health problems by many doctors in Europe and Asia. Common sense would say that building healthy function – resistance to disease at optimal levels – is the best way to help the body heal. The second time I was on Steve Quayle’s radio talk show, Blueprint For Survival, a lady called in to say that she ordered the pollen extract the first show and attributed it to remission of her cancer. I can’t say that it was the pollen extract, but for what I know, I believe it was. At least it was a good on-air testimonial that had the phones ringing off the hook for orders! 2. Extraordinary Strength, Stamina and Recovery Time Benefits. There are numerous legendary Olympic victories directly attributed to this superfood. Strength, stamina and rapid recovery time are critical in world class sports, and Pollen Extract has provided the gold medal edge for power-lifters, 10K runners, gymnasts and others. Mohammed Ali trained on it before his World Championship bout. I was responsible for getting Pollen Extract to Mary Lou Retton and Julianne McNamara before the 1984 Olympics. Mary Lou vaulted her way to win the all-around gold medal in women's gymnastics. Julianne brought home the gold medal on the uneven parallel bars and the silver medal for floor exercise. I give a lot of credit to their coach, Bela Karolyi, the Romanian defector who had trained other gold medalists on Pollen Extract for years in Europe. To quote Karolyi, "I firmly believe Pollen Extract is the ultimate food supplement in sports nutrition. As a gymnastics coach, having had the honor to train Nadia Comaneci and other world class gymnasts, I'm so impressed with this product that I recommend it for all gymnasts." wholesale prices for 33,000 milligrams of bulk powder (small bottle). Rather than pay extra for capsules or tablets with binders and fillers -- plus the 2-3 times mark-up to retail -- you can benefit from immense savings; 33,000 milligrams of pure Pollen Extract translates to almost 6 bottles of high potency 100 mg capsules or tablets (60 per bottle = two per day for a month). That's almost six months of usage which would typically cost you $29.95 per bottle of 100 mg capsules. That's a $123 dollar SAVINGS with just 1 bottle of the bulk powder of Swedish Pollen Extract. Due to my 'sweat equity' in a long holistic health career working with Pollen Extract, I've learned I can help a lot more people help themselves simply by getting them this product -- the single best over-all health-building service I can offer. 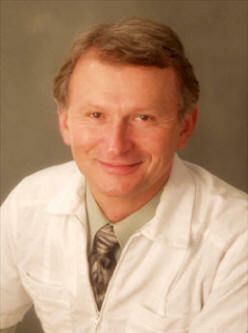 My background has taught me that people heal themselves if given the optimal cellular environment for building health. And there is plenty of peer-reviewed clinical research to show how well Pollen Extract works, as you can read at "Frequently Asked Questions." Storage and suggested usage information is also included there. No capsule or tablet binders or fillers: pure extract powder. 1/8 to 1/4 teaspoon for normal optimal health purposes. Once you understand why SPX UltraFood is a higher grade of 'royal jelly' as was once worth its weight in gold to Chinese Emperors, then you'll know why the difference between royal jelly and SPX is comparable to the difference between your car and a Tesla Motors supercar. And why bee pollen, by comparison, is like a bicycle. So if you want to know how nature's most perfect nutrient concentrate 'UltraFood' will bolster your energy levels and upgrade your DNA with optimal health benefits... try it! the most advanced probiotic available anywhere. International Orders will be shipped via First Class U.S. Mail. Or you can add $27 for Priority Mail + Insurance. For general order policies, click here. Global TeLeCare standards; data analystics for personalized self care.